A. J. Stevens & Company (1914) Limited - The early years. Due to the lack of space in the Retreat Street works, and the growing demand for A.J.S. products, the Stevens brothers urgently needed larger premises in order to increase production. 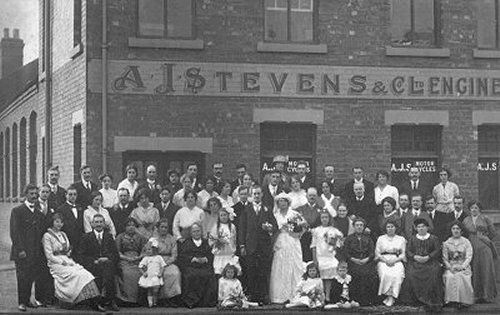 In order to finance the new venture, the brothers formed a new public company called A. J. Stevens & Company (1914) Limited, on 18th July, 1914, with a nominal share capital of £50,000. The directors were George Stevens, Harry Stevens, Jack Stevens, Joe Stevens junior, E. E. Lamb (stockbroker), and E. L. Morcom (engineer). The registered office was in Retreat Street. The Retreat Street offices and factory, as seen in 2002. The brothers didn’t have to look far for new premises, the solution lay close at hand. Round the corner from Retreat Street, near Penn Road, stood Graiseley House, a large Victorian dwelling with around 10.5 acres of land. The owner of the estate, Richard Evans Willoughby Berrington, a civil engineer, wanted to emigrate to Australia, and so he put his estate up for sale. The brothers quickly purchased the Graiseley Hill estate, and work soon began on the first factory building, measuring 260 feet x 80 feet. The model 'D' combination continued to be as popular as ever. An updated version with easily interchangeable wheels and a fully sprung, luxurious sidecar with leather upholstery, was launched. Another view of the Retreat Street premises. 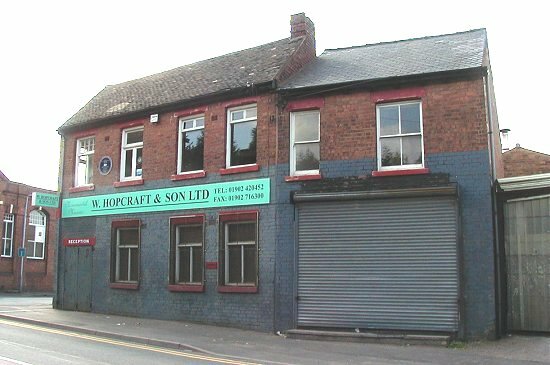 The building on the right was a house, then a shop, purchased by Stevens Brothers Limited in the 1940s as an extension to the site. 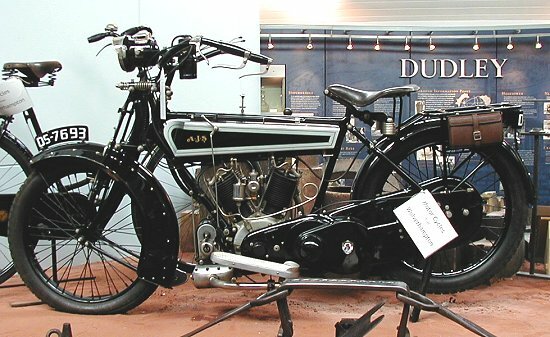 The 1914 model 'D' combination. Courtesy of the late Jim Boulton. Late 1914 was a busy time for everyone at the works. 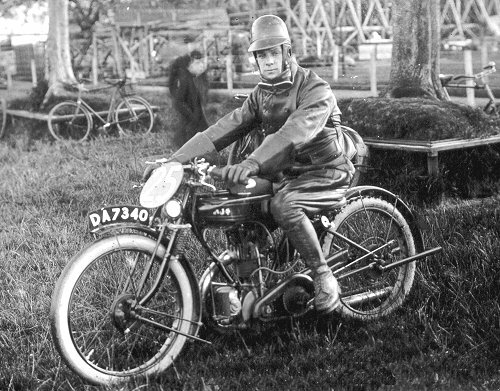 The factory staff worked flat-out to fulfil orders, plans were being made for the next phase of the development at Graiseley Hill, and new motorcycles were designed in readiness for 1915. The wedding of Lily Stevens to Jabez Wood in 1914. The photograph is taken outside the Retreat Street works. Photo courtesy of the late Geoff Stevens. Joe Stevens junior and his wife Lucy in their 6h.p. model 'D' passenger outfit at Old Wyche Cutting Near Malvern. They were taking part in a reliability trial in 1915. Photo courtesy of the late Geoff Stevens. The new motorcycles had an improved frame, with a wedge shaped petrol tank, and very wide front mudguards. The range included a new model ‘A’, a 4hp. V twin design that could be purchased as a solo machine, or a combination, with a specially designed sidecar. The solo machine sold for 66 guineas, and the combination sold for 81 guineas. The 6hp. model ‘D’ remained unchanged and sold for 72 guineas. The combination sold for 88 guineas. A Lucas dynamo-driven electric light was also available for an extra 14 guineas. The 2¾hp. model ‘B’ was available in two versions, a touring model, or a sporting model, both with a 2 or 3 speed gearbox. Two speed models sold for 47 guineas, and 3 speed models sold for 50 guineas. Due to the war, the annual November Olympia Show had been cancelled, and so the new machines were promoted in a special exhibition in the showroom of the London based agents, H. Taylor & Company Limited. The first factory building at Graiseley Hill soon reached completion, and production moved from Retreat Street to Graiseley Hill. The Retreat Street premises continued in use as the office and repair department. Graiseley House, around which the new factory was built. Because of wartime shortages of material and manpower, the model ‘B’ was discontinued. Many things were in short supply including petrol. In 1916 petrol became very scarce and extremely expensive, due to the war. A.J.S. being as inventive as ever, decided to use town gas in the Engine Test House, instead of petrol. A large gas supply pipe ran along the back of the test bench, and small branch pipes fed the gas directly into the engines. At the induction pipe entrance a bunsen burner attachment was fitted so that the quality of the mixture could be adjusted when necessary. The speed could be varied by turning the gas on or off at the supply. Initially the gas was fed directly into an ordinary carburettor, which worked satisfactorily, but was not as convenient as the final arrangement. The engines showed no signs of overheating and ran perfectly regularly, although the speed and performance were not quite as good as when using petrol. The Engine Test House in 1916 with the gas supply in use. In the middle of 1916 Jack Stevens contracted polio after getting wet during a shooting trip. From then-on he could only walk with the aid of sticks. On 3rd November, 1916 the Ministry of Munitions prohibited the manufacture of motorcycles for the civilian market, only military motorcycles could then be produced. The 1916 A.J.S. 4hp. Model 'A' that's on display at the Black Country Living Museum, Dudley. In 1917 the office and repair department moved to Graiseley Hill. The old Retreat Street buildings were handed over to the Stephens Screw Company Limited for additional workshop space. Luckily for A.J.S. the Ministry of Munitions received a large order for motorcycles for the Russian army. The order included machine gun carriers, ammunition carriers and light ambulances. The ministry sub-contracted the order to a number of motorcycle manufacturers including A.J.S. As a result A.J.S. produced 1,100 military machines, all 6hp. models with many of the existing A.J.S. features, including the desirable easily interchangeable wheels. Hostilities finally ceased on 11th November, 1918, and in January 1919 the restrictions on civilian motorcycle production were lifted. Building work at Graiseley Hill restarted with the building of three factory buildings, each measuring 260 feet x 80 feet. They each had the same floor area as the original factory building completed in 1915, but were 1 foot higher, to allow for more head room in the workshop. Graiseley House was properly converted for office use, and the original factory building converted into the machine shop. Before the year was out the works covered 109,586 square feet. Another view of the Model 'A' at the Black Country Living Museum, Dudley. A close-up of the model 'A' and the 550c.c. V twin engine. The buildings were arranged so that everything moved through the factory in an orderly fashion, starting at the receiving and issuing stores on Graiseley Hill at the northern end of the site, to the despatch and repair departments at the southern end of the site, off Marston Road. The large general receiving stores had a basement containing the steel stores, where everything was arranged on racks, then numbered and listed for issue to the works. The smallest section carried was ¼inch round steel rod, used for gearbox push rods. The largest diameter stocked, 3 inches round, was also used for gearbox work, and machined into lay shafts and gears. Graiseley Hill which originally extended from Penn Road as far as the main gates was extended, with a downwards slope for direct access to the steel stores. 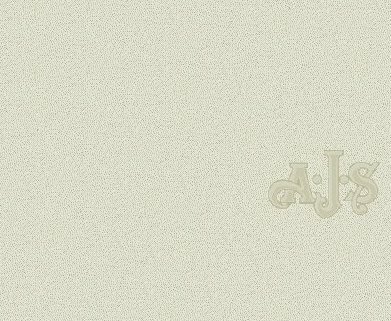 An advert for the A.J.S. 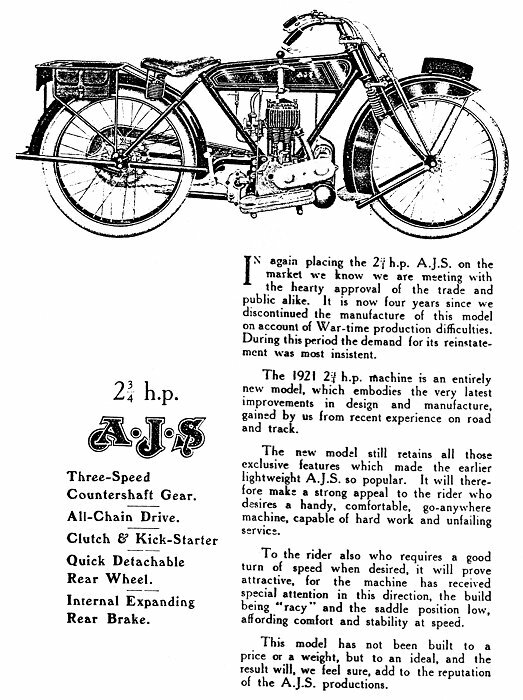 combination, from 'The Motor Cycle' magazine, 4th September 1919. Courtesy of the late Jim Boulton. The machine and fitting shops both had a large number of clever jigs and gauges which were perfected by Jack Stevens. Each of the four brothers had an exclusive role at Graiseley Hill. Harry, the eldest worked on design, particularly engines, and special purpose machinery. George took charge of the commercial and sales side, being largely responsible for the extensive export business. Joe junior was in charge of production, and oversaw the racing and competition side of the business. Jack was in charge of the drawing office and design. 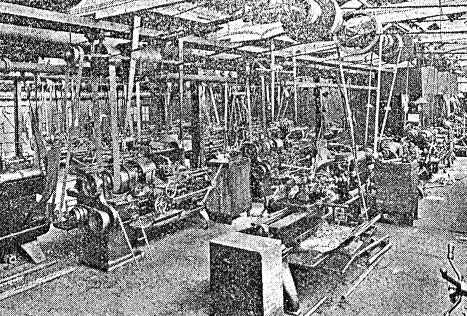 The turret and capstan section of the machine shop in 1920. The engine erecting shop in 1920. The fifth and youngest brother, William, born in 1893, forever known as 'Young Billy' was not a director of A.J.S. Initially he had little to do with the company, working instead in the Stevens Screw Company Limited with his father and sisters. 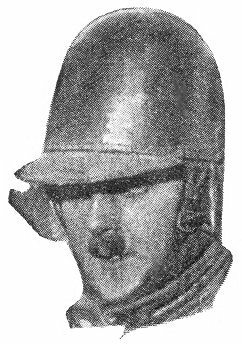 At the onset of World War One he joined-up as a despatch rider and saw service in the Dardanelles during the Gallipoli campaign, and Salonika on the Western Front. On his return from the war, Joseph Stevens senior made him a director of the Stevens Screw Company, whilst his brothers offered him a managerial position at Graiseley Hill, looking after the spares department and the export department. He is well remembered for the excellent motorcycle spares manuals that he prepared. 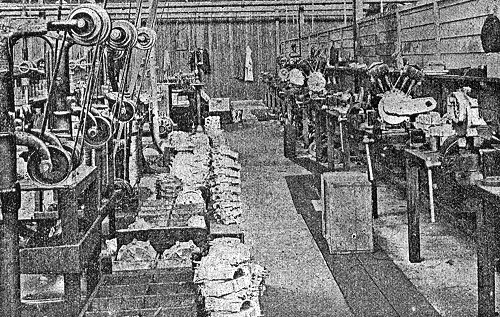 The gearbox fitting shop in 1920. 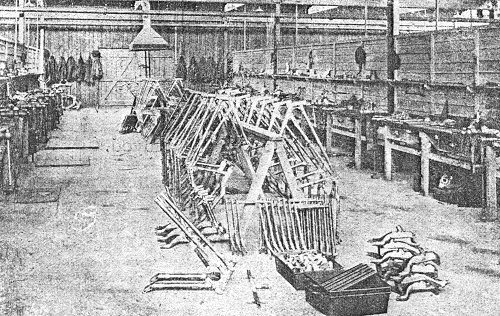 The frame building department in 1920. The latest types of machines were installed, all driven from overhead line shafting. A.J.S. used more modern machinery than any other local vehicle manufacturer at the time. Everything was made to a close tolerance, and any spare part could be quickly installed, just as we do today. This wasn't true for other local makes. At the neighbouring Sunbeam factory, everything was fitted by hand, and filed to size, so that many spare parts required careful fitting, often involved filing to size, or drilling appropriately sized holes. The assembly department in 1920. From 'The Motor Cycle', 10th June, 1920. A new version of the 6hp. model 'D' combination called the 'de-luxe' was quickly produced, featuring a new style petrol tank, a rear stand, a quiet running engine with a cast aluminium silencer, quickly interchangeable wheels, and detachable cylinder heads. The sidecar was more luxurious than ever with full weather protection consisting of a folding hood and cover, side curtains and a storm proof apron. It also had a luggage grid, a tool locker and a spare wheel that was interchangeable with those on the motorcycle. Around 65 of the new machines were built each week. Due to inflation prices varied from 135 guineas to 190 guineas. The machine featured on the company's display stand at the November 1919 Olympia Show, which returned after an absence of 5 years. 1920 saw the reappearance of the Isle of Man T.T. and so A.J.S. 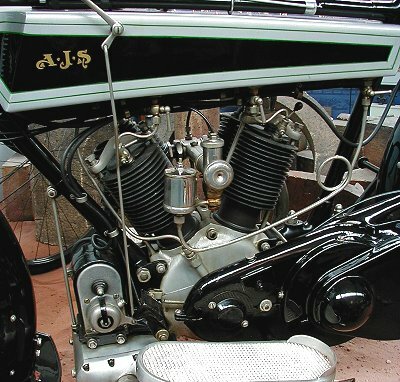 decided to try and repeat the success that it had in the 1914 Junior T. T.
Harry developed a new 2¾hp. overhead valve engine for the T.T. machine, which included a 3-speed countershaft gearbox, to provide 6 speeds by engaging either of 2 engine sprockets. It had a Thompson-Bennett magneto and an Amac carburettor. A.J.S. were very lucky to acquire the services of Howard Davies, who would go on to become a famous rider, and motorcycle manufacturer in his own right. The works team consisted of Cyril Williams, Eric Williams, Howard Davies, Ossie Wade, H. F. Harris, and Tom Sheard. H. V. Prescott. privately entered his A.J.S machine. Howard Davies also entered the Senior event. The machines on route to Liverpool for the 1920 Isle of Man T.T. Courtesy of the late Jim Boulton. The only member of the works team to finish was Cyril Williams. He led the race by over 15 minutes, until four miles from the end when he experienced problems with the gear change. He ended-up pushing his machine to the finishing post, and still managed to win by over nine minutes. It was a great triumph for A.J.S. Although the new engine developed around 40% more power than earlier versions, the mainshafts and crankshaft had not been sufficiently strengthened, and so were prone to breakages. Flying kilometre 27.87 seconds 80.94m.p.h. Flying mile 47.4 seconds 75.95m.p.h. Flying kilometre 29.9 seconds 77.4m.p.h. Flying mile 49.1 seconds 73.32m.p.h. Flying kilometre 33.2 seconds 67.38m.p.h. Flying mile 55.2 seconds 65.22m.p.h. In 1920 A.J.S. took over Charles Hayward's sidecar company and purchased the Stewart Street factory. The company still continued to trade as C. W. Hayward, with Charles as Managing Director. From 'The Motor Cycle', 5th May, 1921. In 1921 a new 7h.p. version of the model 'D' was introduced and exhibited at Olympia in November. The motorcycle on its own initially sold for £159.10s.0d. or £215 with a sidecar, but prices varied due to high levels of inflation. Sales reached an all time high and so the factory was further extended in order to increase production. Another new machine was the '2¾hp. Lightweight Solo' with 3-speeds, kick starter, quick detachable rear wheel, and a low and comfortable riding position. It sold for £95. Early in the year a prototype three wheel car was produced with two wheels at the front and one at the rear. Although the design showed some promise, it never went into production. The model 'B' was reintroduced in March using a 2¾hp. side valve engine, to satisfy the large number of requests for such a machine, following the company's success in the T.T. Listed as a touring machine, it incorporated many new features, including a 3-speed gearbox, chain drive, Amac carburettor, and Lucas Magneto. It sold for £95. The company had another successful racing and trials year. Work had begun on an improved 2¾hp. T.T. machine back in the summer of 1920. The new machine performed extremely well and captured four Class B long distance records at Brooklands on 24th May, 1921. Ridden by Howard Davies. 100 miles 1h 32m 45.6sec. 64.68m.p.h. 50 miles 45m 6.8 sec. 66.49m.p.h. Two hours 130 miles 1054yds 65.3m.p.h. One hour 66 miles 162yds 66.09m.p.h. From 'Motor Cycling' 15th June, 1921. From 'The Motor Cycle' 23rd June, 1921. The A.J.S. team for the Junior T.T. in May consisted of Eric Williams, Howard Davies, H. F. Harris, Tom Sheard, Ossie Wade, George Kelly, and V. Olsson. Yet again it was a triumphant year for the company. 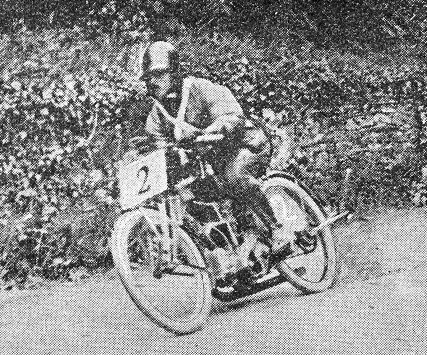 Eric Williams finished in 1st place at an average speed of 52.21m.p.h., Howard Davies came in 2nd, Tom Sheard 3rd, George Kelly 4th, Ossie Wade 6th, and H. F. Harris 8th. Two A.J.S. 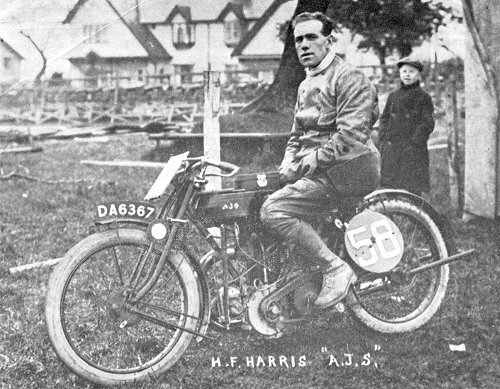 machines were entered for the senior race, ridden by Howard Davies, and H. F. Harris. It was yet another triumph for A.J.S. Howard Davies finished in first place at an average speed of 54.49m.p.h., a full 2¼ minutes ahead of the field. H. F. Harris finished in 14th place. On their return to Wolverhampton they received a jubilant reception. The streets were decorated for the occasion, and the team took part in a procession through the streets, lined with large numbers of cheering people. Eric Williams on his 2¾hp. 350c.c Junior T.T. winning machine. 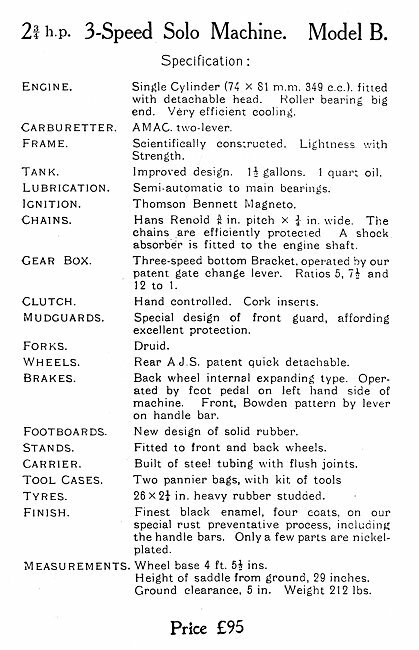 From 'Motorcycling', 22nd June, 1921. Howard Davies and his 1921 senior T.T. winning machine. Courtesy of the late Jim Boulton. Howard R. Davies, who came wonderfully near to scoring a double success in this year’s T.T. races, is single, and commemorates his twenty-sixth birthday next Monday, the 27th inst. The 2¾hp. A.J.S. machine on which he won the senior trophy at 54.5m.p.h. was not the same that he handled in the junior event (when he finished second after puncturing on the second lap, and subsequently retrieving his lost position), but the engine was transferred to the senior frame. It is a wonderful engine too, measuring 74 x 81mm, 349c.c., for it laps Brooklands at 71m.p.h. (so he said), for, apart from two stops at the replenishment pits, he enjoyed a non-stop run. No risks were taken at any time. He passed de la Hay between Ballacraine Corner and Ballig Bridge on the first lap, and thereafter had a fairly clear run until he began to overhaul the tail-enders of the procession. Mist on the mountain proved a slight handicap on two circuits, for it necessitated removing the goggles. Asked if he knew his position, Davies replied “No” and imagined Dance was leading him, through cheering crowds indicated that he himself was among the leaders, despite his limited engine capacity. Davies’s mount ran most consistently throughout. Second for four laps, he attained the lead at the end of the fifth lap, and never lost it again; the only competitor to occupy the leading position for two laps. At this remark, he specially went out of his way to introduce his mechanic, Bob Shakespeare, who has tended the A.J.S. T.T. machine from the outset, and is responsible for Davies’s hill climbing and speed mounts. The A.J.S., which weighed 202lb., he told us, steers perfectly on the Manx course, which no doubt, accounted for the rider finishing so fresh. Noticing that the front rim was untouched, Davies replied to our interrogation that he had never used the front brake throughout. Howard Davies, magnificent rider though he is, was certainly in luck last week, for he accepted a wager of 75 to 1 with S. L. Bailey that he could not name winner of the double event; and won! But for a slight dent in the back wheel rim, the A.J.S. mount was as good as it started, and the Hutchinson tyres wore remarkably well and remained almost unmarked. Other equipment included Druid forks, Amac carburettor, T.B. magneto, K.L.G. plug, Renold block chain on front, and roller chain at rear, A. K. knee grips, and he used Castrol R lubricant and Pratt’s spirit. 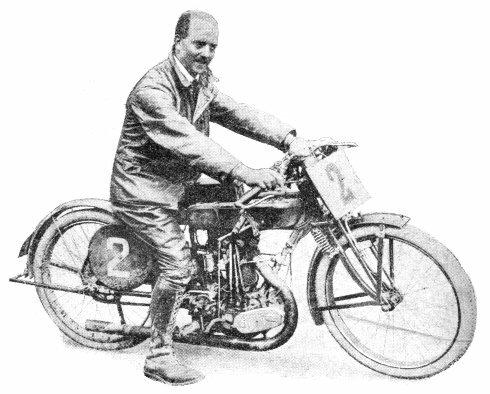 It should be added that, apart from last week’s achievement, Howard R. Davies, when riding a Sunbeam, tied for second place with the late O. C. Godfrey in the 1914 event. After being taken prisoner while flying over the German lines in 1917, Howard Davies, subsequent to his repatriation, joined the Amac Company, and later joined Messrs. A. J. Stevens and Company Limited, as competition manager. Howard Davies in action during the 1921 T.T. From 'The Motor Cycle', 23rd June, 1921. Howard Davies and his machine that won the 1921 senior T.T. From 'The Motor Cycle', 4th August, 1921. Many other success followed in trials and sporting events, and sales were greater than ever. 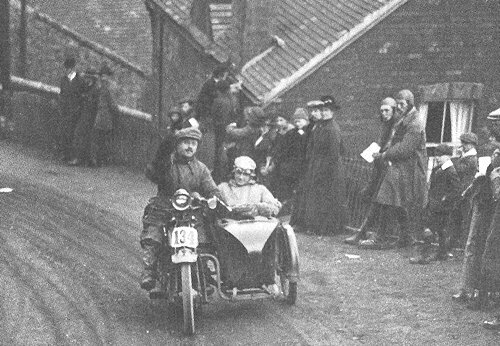 Nearly 600 people were now employed on motorcycle production, and yet more building work was undertaken at Graiseley Hill. The company decided to cash-in on its success in the T.T. by launching two new 2¾hp. sporting models in readiness for 1922, both based on the model 'B'. The standard sporting machine, the 'B1' had T.T. 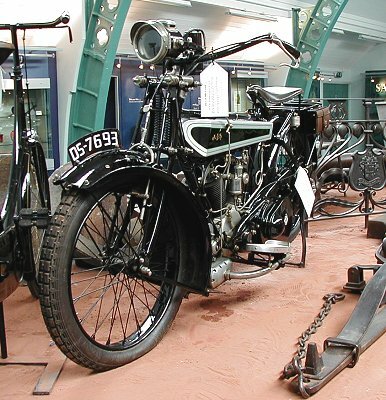 pattern handlebars and footboards, and the stripped sporting machine, the 'B2' had no kickstarter or side valance to the front mudguard, but included a lighter chaincase. Both models were priced at £85. A new lightweight sidecar was also introduced for the model 'B'. It included a stormproof apron and sold for £25. From 'The Motor Cycle', 15th September, 1921. From 'The Motor Cycle', 10th November, 1921. The image above and the one below are from a 1921 catalogue. The 1922 junior T.T. took place on 30th May. The A.J.S. entrants were Howard Davies, Frank Longman, H. F. Harris, Tom Sheard, George Kelly, George Grinton, and Herbie Chambers. It was another successful race for the A.J.S. team who achieved their 4th consecutive win. Tom Sheard finished in first place at an average speed of 54.75m.p.h. George Grinton finished in 2nd place, and Herbie Chambers finished in 14th place. The others did not finish. There were three A.J.S. entries for the senior race, Howard Davies, George Kelly, and Ossie Wade. Unfortunately Howard Davies and George Kelly were forced to retire with mechanical problems. Ossie Wade finished in 12th place, a disappointing race for the team. H. F. Harris and his 1922 junior T.T. machine. 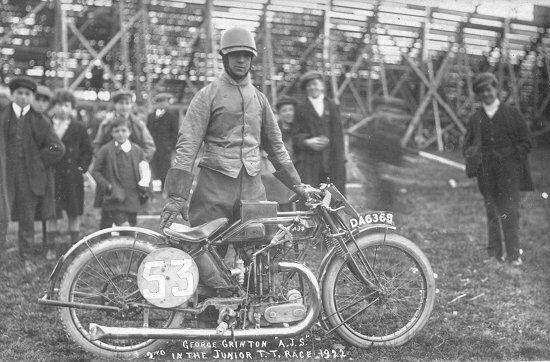 George Grinton and his 1922 junior T.T. machine. The company decided to capitalise on their achievements in the T.T. by launching a new machine, the '2¾hp. three speed overhead valve T.T. model', soon being known as the 'Big Port' It sold for £87 and was displayed at the Olympia Show. The demand for sidecars had reached an all time high, and so A.J.S. decided to look around for larger premises because of the cramped conditions in Stewart Street. In 1922 the Briton Car Company went into voluntary liquidation. 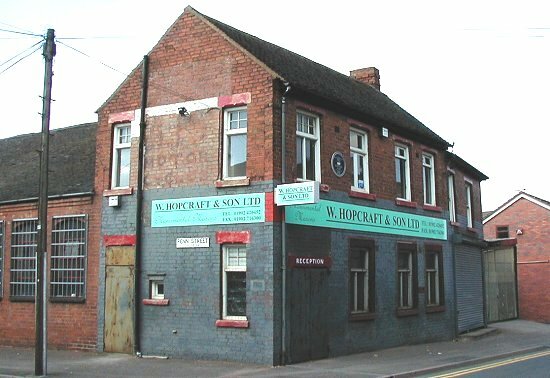 Their Lower Walsall Street factory was put up for sale, and Page & Sons, Estate Agents sold the Walsall Street factory on October 3rd, 1922, for £7,000 to A.J.S. Before the end of the year the sidecar business moved to Lower Walsall Street, and by the end of 1924 the factory had been expanded to cover 150,000 square feet. By the end of 1922 the Graiseley Hill factory covered around 167,000 square feet, and sales remained high. In 1923 A.J.S. began to manufacture wireless receivers in part of the Lower Walsall Street factory, thanks to Harry Stevens, a keen radio enthusiast, and radio amateur. In 1923 Howard Davies left A.J.S. 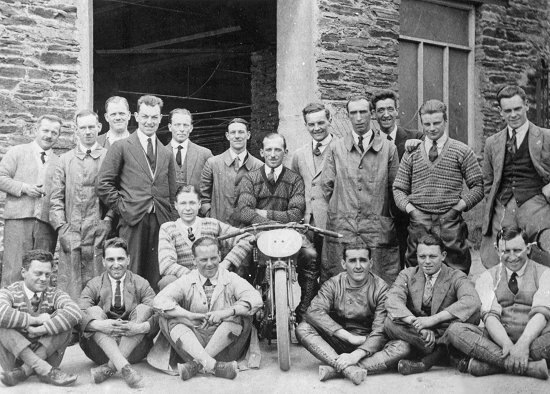 to work for Hutchinson tyres, before starting his own company, HRD in 1924.. There were nine A.J.S. entries for the 1923 junior Isle of Man T.T. held in June. 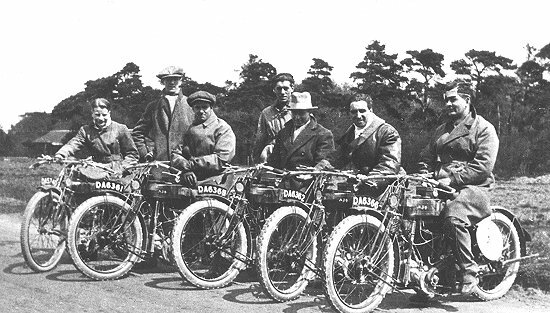 The machines were ridden by Howard Davies, Tom Sheard, Jimmy Simpson, H. F. Harris, Frank Longman, Herbie Chambers, Billy Hollowell, Charlie Hough, and J. Stirling. Only two of the riders completed the course. H. F. Harris finished in second place at an average speed of 55.16m.p.h., and Frank Longman finished in 6th place. J. W. Hollowell, Arthur Curran, G. Kelly, George Rowley, and Charlie Hough. Front Row: Frank Longman, Clarrie Wise, N. Black, L. R. Cohen, Arthur Cohen, and Ossie Wade. Courtesy of the late Jim Boulton. 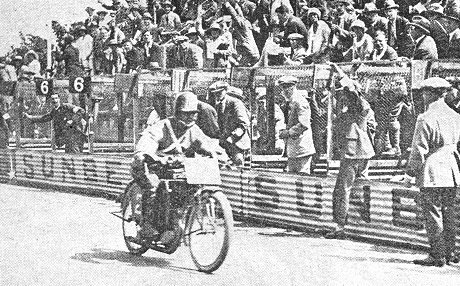 H. F. Harris at the end of the first lap of the 1923 Junior T.T. Courtesy of the late Jim Boulton. Four A.J.S. 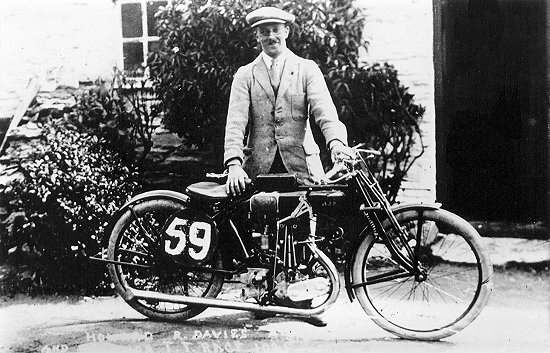 machines were entered for the senior race, ridden by Howard Davies, H. F. Harris, Syd Crabtree, and Charlie Hough. Again only two of the riders completed the course. They were Syd Crabtree who finished in 17th place, and Charlie Hough who finished in 20th place. Charlie Hough. Courtesy of the late Jim Boulton. On 24th June A.J.S. entered a team for the 350c.c. French Grand Prix held at the Circuit de Touraine, near Tours. Frank Longman finished in first position in the class, at an average speed of 56.4m.p.h. The team were again successful in September when Ernesto Gnesa won the Italian Grand Prix of Nations at Monza. Seven models were displayed at the Olympia Show including the top of the range 7hp. model 'D' de-luxe passenger combination, which sold for £130. A cheaper 'no frills' version, the 'D1' sold for £95. The 'B' and 'B1' models were priced at £62, a lighter sporting 'B5' sold for £52, and two sporting machines, the 'B3' which replaced the T.T. sports model, and the 'B4' racing machine both sold for £65.